Chateau du Pin is located outside the village of Champtocé-sur-Loire, 18 km (30-minute drive) west of the city of Angers in the province of Anjou. Angers is approximately 200 miles southwest of Paris (4+ hours by car or train and 95 minutes by TGV train) or about 60 km (hour drive) east of Nantes. Modern shopping centers, banks, hospitals, car rental agencies, and train station are in Angers. The nearest international commercial airports are located in Nantes and Paris. 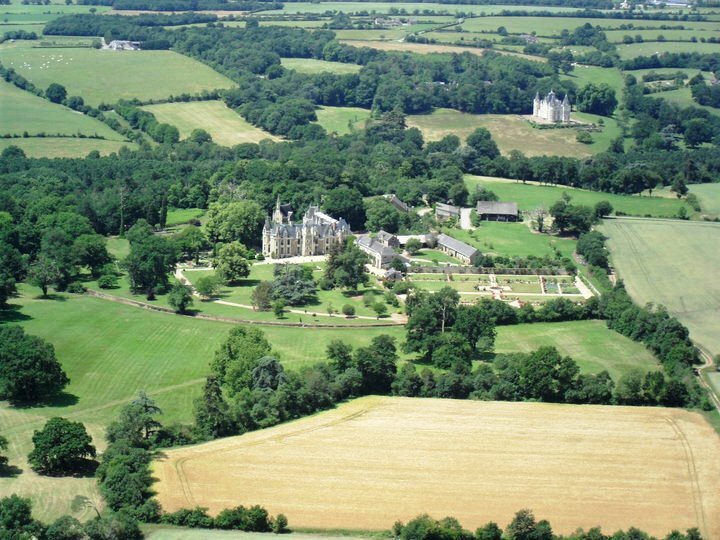 Part of Le Pin's charm is its location in the beautiful Loire Valley country side, surrounded by fields and vineyards. While the nearby village of Champtocé does have a market, bakery, and pharmacy, a car is highly recommended for shopping and exploration. Whether you drive from a major city or take a train to Angers and pick up your car there, the following information will be helpful. From Paris or Charles de Gaulle airport (322 kilometers; about 200 miles or 4+ hours by car): Take N104 (or sometimes called A104). It is the beltway that goes around Paris. Follow it around to the south until it meets with A10. Look for signs that say Bordeaux/Nantes. Take the Autoroute A10 to the west. Take A11 when it divides and head toward Chartres, Le Mans, Angers, and Nantes. These are toll roads and US credit cards may not work. You should have some cash. About 18 km (15 miles) beyond Angers, take the exit 19 (Sortie 19) marked "Chalonne". After the exit, pay the 1.80€ toll at St. Germain des Prés. (Toll fees are subject to change. Amounts mentioned were correct in the spring of 2018). Take the second right off of the roundabout onto a small paved road (between the large industrial buildings) marked by directional signs for "Jardin du Chateau du Pin". Follow the signs to the chateau. As you enter the farm of Le Pin, follow signs for "GITE" (a somewhat serpentine path between the barns) to the parking area set aside for our chateau guests. If you wish to go the Angers from A11 (to visit the cathedral or castle, do some shopping, go to the train station etc,) exit at Sortie 18 and follow signs for “Centre Ville”. From Nantes (60 kilometers, about 40 miles): Take A11 towards Angers/Paris. There will be a 8.60€ toll in Ancenis. Take the exit (Sortie 19 marked "Chalonne"). After the exit, pass straight through the roundabout onto a small paved road (between the large industrial buildings) marked by directional signs for "Jardin du Chateau du Pin". Follow the signs to the chateau. As you enter the farm of Le Pin, follow signs for "GITE" (a somewhat serpentine path between the barns) to the parking area set aside for our chateau guests. An alternative route to A11 is D723 (the old N23). It is the main non-toll road that runs between Angers and Nantes, paralleling the Loire. As you approach Champtocé-sur-Loire you will start to see signs for "Jardin du Chateau du Pin". Le Pin is approximately 3 km from the center of Champtocé. Train service on the French railway (SNCF) is available to Angers from throughout France. The TGV fast train takes about 90 minutes from the Montparnasse station in Paris to Angers and 2½ hours from Charles de Gaulle airport (CDG) Terminal 2F. There are hourly trains from Montparnasse and roughly four direct trains from CDG per day. TGV service requires assigned seats and reservations that can be procured at the station or on-line at www.tgv.com along with up to date timetables. The website has timetables and reservations from other cities as well. Note: the code for Angers is “Angers St Laud (49)”. There is local train service (Ter service) to Champtocé that runs between Angers and Nantes. There are usually four trains a day in both directions. For an online schedule visit: http://www.ter-sncf.com/pays_de_la_loire/carte_horaires/index.asp. Choose “04 Angers - Nantes” in the drop-down menu, then click on the link "04 Angers - Nantes" that appears, to see the timetable. There is a telephone at the Champtocé train station, but no taxi service. All the major rental car companies have offices and cars available at the train station in Angers. Note that rental car offices are closed on Sundays, with the exception of the airports of Paris and Nantes. Taxis are available at the station in Angers. Fares from the station (gare) to Le Pin are about 60€. If you are using GPS based navigation system or map application, enter in “Le Chateau du Pin”. The coordinates of Le Pin are: 47º 25’ 40” N; 000º 50’ 58” W.
Fresh markets are a wonderful tradition in France. Incredible produce, meats, cheeses, condiments and more can be found there. The Spar Market in Champtocé is a small grocery with an excellent butcher. It is open Tuesday-Saturday 8:00-12:30 and 3:30-7:30 pm, Sunday 8:30-12:30, closed Monday. Butcher counter hours are limited and are posted. Full service supermarkets (SUPER U) are located in nearby St. Georges, Ingrandes and La Pommeraye. Hours: 8 am-7 pm daily, closed Sundays. Patisserie: France is noted for wonderful patisseries (bakeries). There is an exceptional bakery/patisserie on the main street of Champtocé and is known for their fresh artisanal breads, desserts and chocolates. They are open Tuesday through Saturday 6:30-1:30 and 3:30-8:00, Sunday 7:00-1:00, closed Mondays. Most of France closes down at midday, generally from 12:30-3 pm. So it is wise to plan your day with this in mind.